It is not always possible to ensure that you have a full skill-set and competencies within your organisation on a continual basis. That's fine. But if this isn't managed and controlled at the design stage, it can lead to skill shortages at critical points during your project. QEM Solutions offer a unique service that is key to dealing with this problem. Often the subject of ridicule, Risk Management is a serious business. And a tool that has become an essential requirement in both business, design and construction. 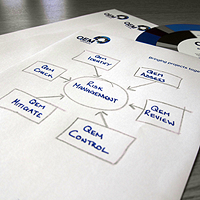 Here at QEM Solutions address risk management in a logical and methodical manner. The result? A definite increase the probability of success of project, apparatus and infrastructure. Our Technical Writers are experienced Engineers and their deeper understanding offers necessary value to the start of a new venture. Often relied upon by or clients in previous projects, our Technical Writers have grown to become the information hub of the Engineering and Quality Departments.